This recipe received a 10/10 from Jason. I don’t know if I have ever made something he liked so much before…ever. He usually hates scale ratings. I always asked him to rate things on a scale of 1 to 10 and it usually ends with him changing the subject so I forget he never rated what I asked. This time, however, he said “10” instantly. This recipe is super easy and delicious. It is too heavy for me for summer, so I plan to make it again once things cool down here in IL in a few months. 1. Preheat oven to 350F. Spray a 9″ baking dish with nonstick spray. 2. In a large bowl, mash the potatoes. Add the butter and milk and whisk with an egg beater on high until highly whipped. Stir in the vegetables and seasonings. 3. Pour mixture into the sprayed dish. Smooth out with a rubber spatula. 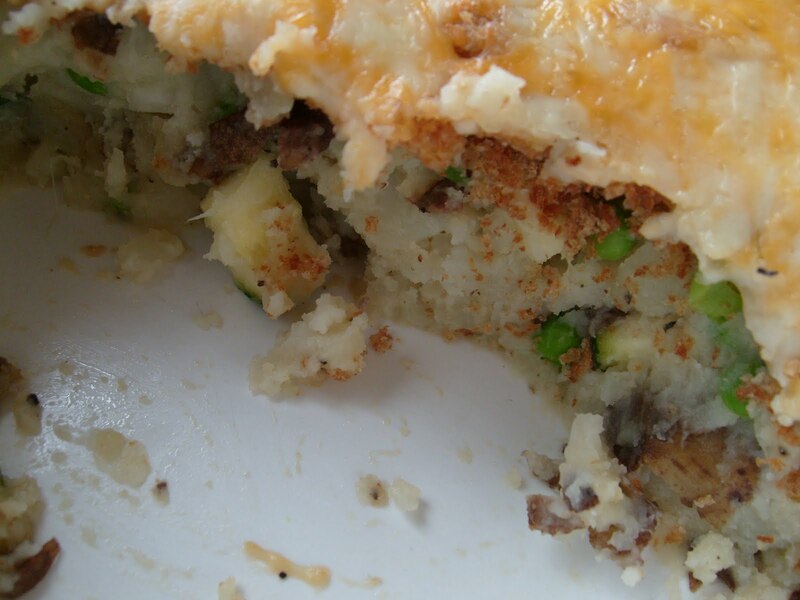 Top with bread crumbs and cheese. 4. Bake for 20 minutes or until cheese is melted and the edges are starting to brown. Jason and I were unsure what to make for dinner the other night. The refrigerator was full of leftovers, all of which we had eaten at least once and while they were tasty, we were in the mood for something different. We settled on Mexican, but were stuck again. Jason also has meat tacos, so when I suggested refried black bean burritos, he was a little hesitant. I told him not to worry, which I often have to do when I am cooking something new. A good friend of mine had called, so I handed the spatula and a few simple instructions over to Jason for cooking the dinner. Needless to say, he was successful. We enjoyed our burritos that night and there was even some for another meal. This made me think about how versatile this mixture really is. With that in mind, I am posting the recipe along with a few meal ideas. Heat the oil in a large skillet over medium-high heat. Cook the onions and peppers until tender. Add the black beans and cook for one more minute. Turn off the heat and add the cherry tomatoes. Place 1/2 cup of mixture on the center of a tortilla. Top with a dollop of sour cream and some shredded marble cheddar cheese. Place 1/2 cup of cooked brown rice on a plate, top with the black bean mixture and shredded cheese. Preheat the oven to 350F. Spray a baking dish with cooking spray. Place 1/4 cup of mixture in a tortilla and roll up. Place the rolled tortilla in the pan and repeat until the pan is full. Cover with green taco sauce and/or salsa. Top with cheese. Bake for 30 minutes. Preheat oven to 375F. Roll out (or prepare a homemade) pizza crust. Cover the pizza crust with a thin layer of the refried bean mixture. Top with extra onions, peppers, and tomatoes. Cover the pizza with marble cheddar cheese. Cook for 12-15 minutes or until the crust is crispy and the cheese is melted. 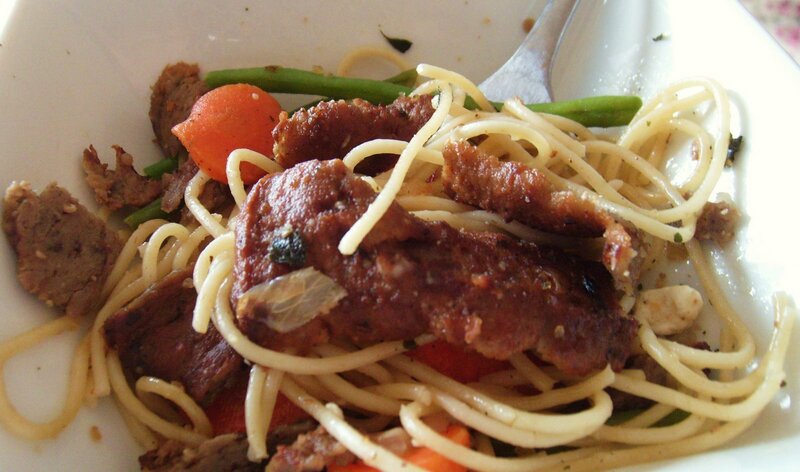 If you have any ideas for meals with refried beans, please leave a comment! New posts three days in a row? Yes, I think I am back! The semester came to an end this week. I still have my thesis to work on over break, as well as some recommendations for the work site wellness program I am working on with Head Start. Besides that, I will be working at Ruby Tuesday and (hopefully) cooking and posting up a storm! Last Thursday the other interns and I got together for lunch. Each person brought a dish to pass, so Whitney and I worked together to make some stir-fry. Whitney made some lemon-grass Chicken, while I sauteed some vegetables and made WAY TOO MUCH rice. I am not quite sure what I was thinking when I made 3 cups of dry rice for 8-10 people. Needless to say there are a lot of left overs. I also had purchased some diced ham last week for Hawaiian pizzas (Jason’s favorite), but we didn’t end up making them. 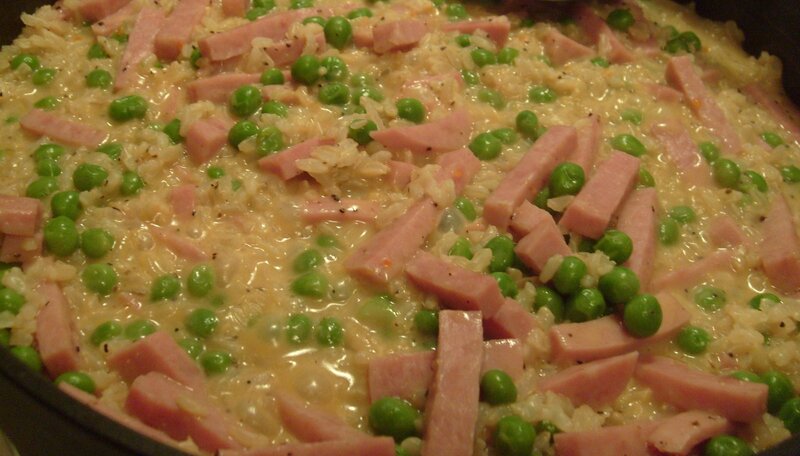 I decided to improvise and make my own Creamy Ham and Pea Risotto. I am not quite sure if this counts as risotto, since I have never made one before, but it appears to have a similar consistency. If anyone is an expert on risotto, I would love to learn more! Place all of the ingredients into a large skillet and heat pan on medium-high. Continuously stir the ingredients. The sauce will begin to boil. When this happens, turn the heat down to medium and continue to stir. Stir contents until a thick consistency is obtained (about 10 minutes). Turn the heat off and let cool.